Friday late afternoon, a rich man named Joseph went to Pilate and asked for Jesus’ body so that he could give Him a proper burial. 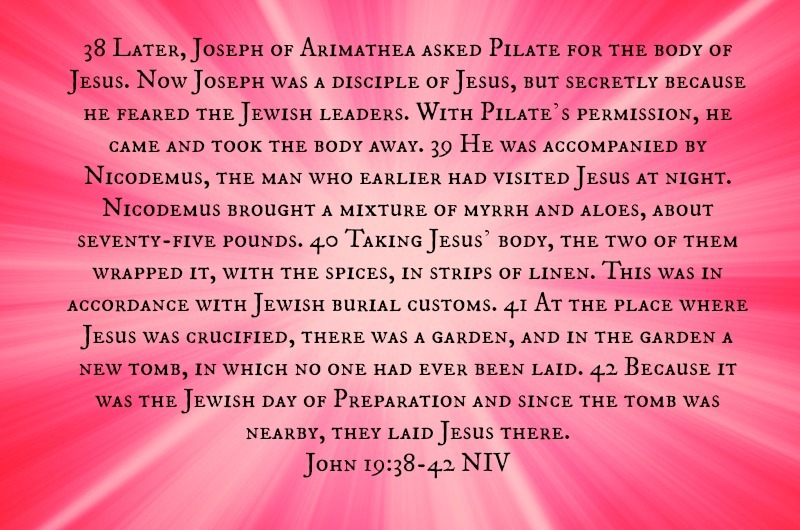 After Pilate agreed and with sunset coming soon, Joseph and Nicodemus took Jesus’ body to the tomb and prepared His body in accordance to Jewish customs. What I discovered was interesting that both men were Sanhedrin. You know the ones who were shoulder to shoulder with the chief priest, elders, teachers of the law, etc….that wanted Jesus dead. These two men however were secret followers of Jesus. This act of burying Jesus is a symbol of a loving service that they provided for Jesus. According to what I was studying, the amount of the myrrh and aloe mixture they prepared for Jesus was enough for two royal funerals. Jesus came into this world in a lowly manger scene, slaughtered as a common criminal and buried like royalty. What impression does that leave on your heart? The Sabbath was a day of rest and they were not allowed to do any kind of work but yet we see in Matthew 27 that the chief priest and the Pharisees went to Pilate on the Sabbath day wanting the tomb secured. Read their request to Pilate. These hypocrites were not concerned about the people being deceived by Jesus or His disciples. They were looking out for their own interest once again. Their concern was that if the people were persuaded to believe that Jesus had risen, they would be seen for who they were and that would have brought them shame and embarrassment. Don’t you know they were scrambling around like mad and scheming when morning came and the guards report that Jesus had risen. But I am jumping ahead of the story. I am going to leave you with one last thought to ponder upon. In God’s plan to create the Earth, He did His work in six days and on the seventh day He rested. Looking back on this past week of events, Jesus did His work (Palm Sunday through Good Friday) in six days laying in the grave on the seventh day resting. Coincidental or another part of God’s perfect plan?